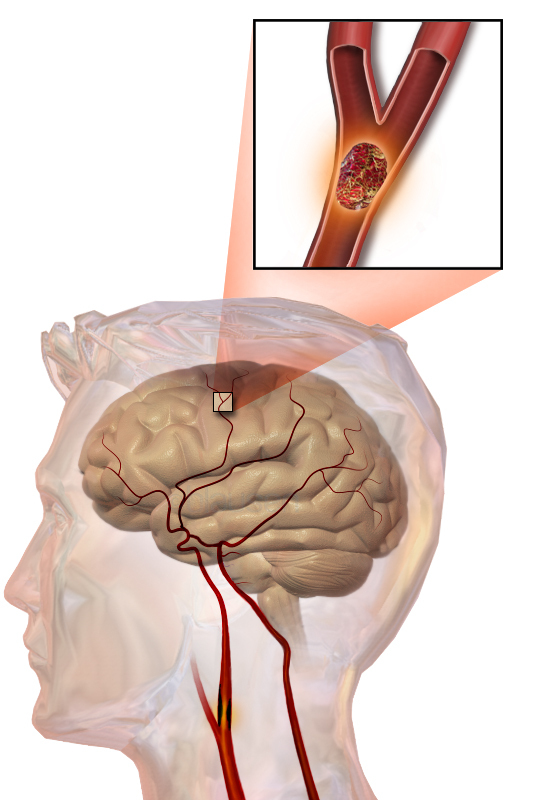 In humans, acute ischemic stroke is the primarily result of a blood-clot that moves toward the brain and blocks one or more important blood vessels that supply blood, oxygen, and nutrients to brain tissue (Fig. 1), causing brain tissue death. Now there are 2 methods to remove this block: the Genentech Inc. drug tissue plasminogen activator (tPA) that “dissolves” the clot and endovascular procedures to physically remove the clot. Both are beneficial to stroke patients, but cannot be used on all stroke patients. Thus, this creates the need for stroke research and funding. For the development of new stroke treatments, guidelines need to be established to best utilize abysmally low funding for stroke research from government agencies, and to guarantee that research is being conducted in a strict manner aligned with the standards of the research community. Fig. 1. blockage of a brain vessel with a blood clot: Courtesy of Blausen Medical Communications, Inc. Surprisingly, even though acute ischemic stroke is the result of a blood clot, many stroke studies are not utilizing clinically relevant blood clot-induced stroke models (i.e. : embolic stroke), but are focused on “ischemia” models where a suture is moved into an important vessel to produce a block. In 2017, a workshop was held at National Institute of Neurological Disorders and Stroke (NINDS) in an attempt to discuss and establish acceptable guidelines for stroke research so that a therapy can be developed. The workshop was diffuse, with many diverse scientific opinions from invitees and attendees. The result was a set of recommendations that can be applied to stroke research. First, researchers should apply RIGOR guidelines to all studies to include Power analysis, blinding, randomization, and statistical analysis. All studies should be completely transparent with full documentation in dated notebook, and the data should be counter-signed and trackable). This is just good laboratory practice- GLP. The first phase proof of concept study should be conducted in a single species and a single gender (Note: the species is not defined). Attendees were well aware of the limitations of young rodents to conduct translational research, because rodents (rats and mice) are overly adaptive to stroke manipulations. An additional option for a research model includes the standardized rabbit embolic stroke model used in the development of tPA, the only Food and Drug Administration approved drug therapy for stroke. The second phase should incorporate gender analysis (male/female subjects) and aged animals and should be conducted in multiple species. This study will be more practical and incorporate dose-response and therapeutic window analysis and will be the basis for dose and timing estimation in humans. The third phase will be a randomized multi-site study with large numbers of animals so that meta-analysis can be conducted. [All stages of development should be conducted using a team approach, including basic researchers, translational researchers and clinicians]. Committee members also recommended that exorbitantly expensive aged animals be used for stroke research, and co-morbid conditions (diabetes and hypertension) need to be included. There was an important idea to ensure that doses are adjusted for efficacy responses in aged animals and rodents with co-morbid conditions because the same low dose may not be optimally effective in aged animals/co-morbid animals as in young animals. Committee member emphasized that data should be reproduced by independent research groups, and that there should be auditing of data from laboratories if funded by the National Institutes of Health. Oversight of all aspects of translational stroke research is the ultimate goal. In conclusion, since acute ischemic stroke is the primary cause of disability in the United States with an estimated cost of $68.9 billion annually, and the fifth leading cause of death, there is a need for focused, rapid development of new therapies. The development plan should incorporate multiple “stroke” models in multiple species (i.e: rat/mouse and rabbit, or possibly non-human primate) in multiple laboratories to ensure reproducibility and so the vision of developing a new stroke therapy is not a lost opportunity because of failure or futility when ultimately tested in stroke victims. Each year there are approximately 800,000 new stroke victims in the USA; this number has now been stable for many years. Stroke does kill 130,000 of its victims annually! Now with established transparency and therapy development guidelines for researchers to use in their work, there is a need for increased funding support to allow us to efficiently test new strategies and approaches to treat stroke. Translational Stroke Research Opportunities and a Strategy to Develop Effective Cytoprotection.